This morning I picked The Hanged Man card. The keywords of The Hanged Man are “Sacrifice”, “Halt”, “Not Choosing”, “To Wait”, “To Delay”, “Suspension”. Normally I would invite such activities. I find reflection and meditation to be important towards my health and well being. The problem? David and I are going to the Meet the Breeds dog show at the Javits Center today. There will be 160 breeds of dog all in one place. If you know me, you know that I’m preoccupied with owning a dog. My parents always thought that the big city of Peoria, Illinois was no place for one, in spite of the fact that we owned a huge (albeit unfenced) backyard. I wanted a Golden Retriever. I wanted one so badly that at one point I cut and pasted photos from a Zillions exposé on dog adoption to the bulletin board in our kitchen. There were photos of dogs with captions from kids saying “I felt good that I was saving an animal’s life.” I attempted to give them the silent treatment so that they would take me to the kennel. But to no avail; “The city’s no place for dogs, Brad.” Cruelly, they gifted some sort of dog paraphernalia every year for my birthday until they knew I had given up my begging: a statue of a Golden Retriever, a card with a Golden Retriever on it, a book about Golden Retrievers… But never an actual Golden Retriever. And now that the moment has arrived for my childhood dreams to come true, I pick The Hanged Man card. Naturally my mind asks, “What does this mean?” Surely I should think long and hard about the responsibilities of owning a dog, but I already have. I realize that I’ll have to sacrifice a few happy hours in order to get home to let the little friend get some exercise. I get that part of it. Maybe it means that I’ll fall in love with a Pekingese or a Chihuahua in spite of finding small dogs annoying? Or maybe a cat is really the way to go? Maybe I’m more of a cat person? Given that New York City apartment rules are much kinder on cat owners, I may find it easier. But of course The Hanged Man card has another meaning. 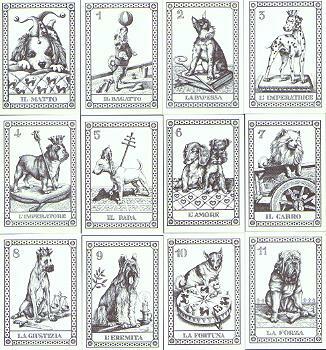 In the familial drama of the major arcana, he symbolizes the son, suspended in air, waiting to be born. In my case, The Dog Lover, waiting to finally get what he’s always wanted. I knew there was a reason I pulled it. Next Post Rachel Zoe is pregnant! Haha great post 🙂 . Loving the fact that you can read your own cards and not pull yourself to pieces worrying about all the inflections. Why, thank you. I’ve gotten into the habit of pulling a card each morning and writing a page about it. I find it helpful in illuminating the meaning of each card. But yeah, sometimes it’s hard to see the bright side with some cards…like, oh, Death for example!